In the previous post I made it clear that I was defining evolution in terms of changes in phenotype. This is an important point, as many only consider changes in gene frequency to be evidence of evolution. As an example, in a recent article in the scientist (http://www.the-scientist.com//?articles.view/articleNo/35317/title/Humans-Under-Pressure/) the author writes: “Although the team did not find any actual changes in gene frequencies—the gold standard for demonstrating evolution has taken place . . .”. This would seem to imply that it is genetic change, rather than phenotypic change, that is the important sign that evolution has occurred. There is a logical fallacy here: While a change in allele frequency necessarily means that evolution has occurred, the opposite is not the case. Documentation that evolution has occurred does not necessarily mean that allele frequencies have changed. 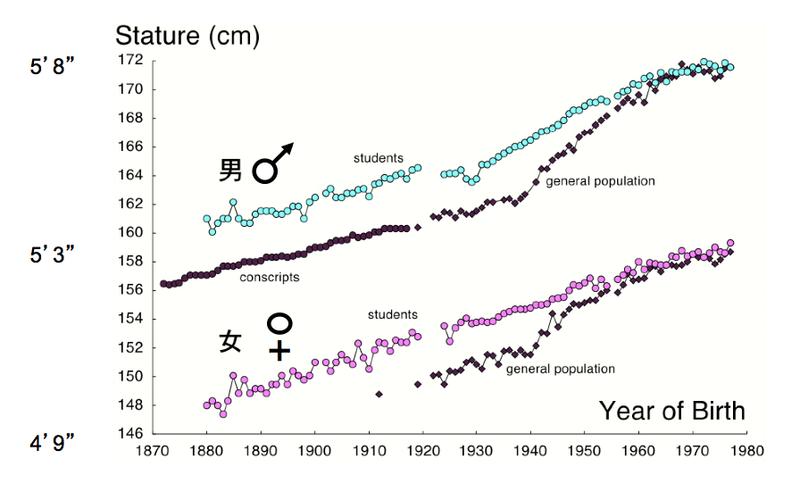 To see this, consider the change in stature of the Japanese people since 1870 (figure modified from http://www.dh.aist.go.jp/en/research/centered/anthropometry/). Since 1870 there has been a secular change in the stature of the Japanese from roughly 5 feet tall in 1880 to the modern height in 1980 of roughly 5 feet 5 inches (that is averaging men and women). It is safe to say that little if any of this change in stature is due to a change in allele frequency. The rather obvious conclusion is that this change in stature is due to a change in diet from a largely starch (rice) based diet in the 1800’s to a modern diet rich in proteins and vegetables. The best data on this are shown in the dietary changes since the end of world war 2 (from www8.cao.go.jp/syokuiku/data/eng_pamph/pdf/pamph3.pdf). The question is, is this evolution? Recognize that the heights given in the graph are adult heights, thus, I can reasonably argue that these are adult phenotypes, that will be subject to at most minor changes within individuals. In short these are not developmental changes. Thus, we see the population getting larger due to the birth of individuals that will grow to be tall, and the death of older Japanese that were shorter. This fulfills my definition of evolution, and as a consequence it seems to me we must call it evolution. Note that if you do not accept my definition, it is also evolution under Futuyma’s definition. That is it is a lasting change in mean phenotype that transcends the life of an individual. Much more complicated, in my mind is whether secular changes in phenotype due to secular changes in the environment count for evolution. I know of no clear examples of this, so a hypothetical example will have to suffice. It is known that snakes grow larger in warm environments, thus, it is reasonable to imagine that the average size of garter snakes will increase as a result of global warming. This change could involve simply changes in the environment (mean temperature), and nevertheless would satisfy both my definition, and Futuyma’s definition of evolution. It seems to me that if it satisfies the definition of evolution we must consider it to be evolution. I will say I am not fully happy with this, but well, it is what it is. Addendum: As evolutionary biologists we often find ourselves fighting the fight of evolution vs creation. I think that this has the effect of Balkanizing our thinking. This is particularly true of our thinking of what is and isn’t evolution. I am purposely writing this blog to be read by evolutionary biology professionals, and as such trying to push my thinking to the logical ends, whether or not it makes it difficult to hash over stale arguments about whether or not Jesus petted dinosaurs (by the way: Assuming he kept chickens, and given we know that birds are Saurischians, yes, he probably did pet dinosaurs). This entry was posted on Monday, April 29th, 2013 at 3:21 pm and is filed under Evolution and the phenotype. You can follow any responses to this entry through the RSS 2.0 feed. You can leave a response, or trackback from your own site. Thank you very much for such a great information ! you should research mote about Spain, please. For sure I’ll read it! The causes and consequences of human secular trends in height is a fascinating field if inquiry. Much written on this topic, even by me! Notable in the Japanese data is that the fastest rate of ‘catch-up’ between the more privileged university students and the general population is during the years of World War II – this is the least likely period as risks for poor nutrition, infection and the other usual negative influences on growth would at their worst. 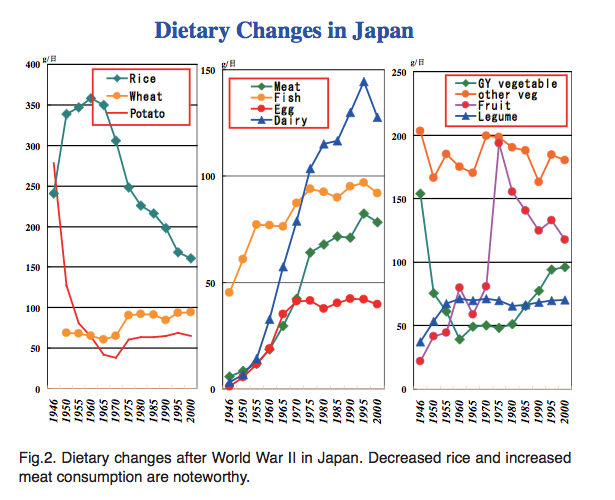 The diet data you show start in 1946 and show the most significant changes after 1950. So, the change to more meat, dairy and vegetable cannot be the cause. The war changed Japan’s economy and social structure – could this be a reason for the closing of the gap in height between social classes? A social network approach to this has been taken by Hermanussen and colleagues — see, Aßmann C, Hermanussen M. Modeling determinants of growth: evidence for a community-based target in height? You make a reasonable argument that it was something other than diet that changed. Thanks for pointing that out. Fortunately my argument does not depend on the causal agent being diet, however, it would be nice to know what that agent was! I think generations are increasingly being higher because with the passage of time humans will better feeding which causes the body to be higher and better life expectancy. That in a sense is the whole point of this blog. The point is that I am taking the view that phenotypes create new phenotypes, and that they do so using a “transition equation”. The point of the blog is that anything can be in that transition equation, including but not limited to genes. Like any change of perspective in a complex system, it changes nothing and it changes everything. It changes nothing in that “genes” are still the major form of inheritance, and molecular geneticists still have an important job. It changes everything because it is more in line with reality. Selection acts on phenotypes, our theory should be based on phenotype. Genes are devilishly hard to define in the modern world, a problem for a gene based view, but from a phenotype based view, define gene as you will, what we care about is its effect on the transition equation. I disagree that “cultural evolution” is qualitatively different than “biological evolution”. In fact I do not like the terms. Evolution is change in phenotype, what you are really talking about is different modes of inheritance. Since they all get glommed into the transition equation in some form or another, this is a matter of details, not things that are qualitatively different and deserve different names. In fact, I shall later argue that selection on phenotypes creates inheritance from what ever aspects of the environment are available. I think of biological evolution as requiring genetic changes, because genes are the vehicles of the heritable information. Suppose the genetic changes (allele frequencies, or anything else) are canalized, so that the phenotype stays the same. In that case the genetic variation can drift neutrally. Don’t you think this is evolution, too? Persistent phenotypic changes could be due to plasticity, and as such revert to the previous phenotype when the environment changes back (to not being able to provide much else but rice, for example). Is that really evolution, then? I realize you’ll say yes, but I think most biologists will say it is not. Cultural evolution (call it what you want), on the other hand, can affect the phenotype as well, and is inherited by different means (ideas/memes?). This seems to make it distinct from biological evolution, no? It´s very interesting. In Spain there was a change in stature after the Civil War and the next years. The society was poor and the food and sanity very bad. In this time the stature was similar, without changes. Since 1975, when Spain was open to the world, the society was grown up in quality of life (can eat proteins) and stature in parallel. It´s curious, but i don´t know wich is the porcentage of evolution or diet. In a short space of time maybe only diet, but what happen if we use the data of 200, 500 or 1000 years ago. Thanks for the information i will still reading your studies from Spain.